During the first two days, leading up to CP1 were very hot. The temperatures were reaching 30 Celsius and over in France, Germany and Austria, Switzerland, we haven’t even hit the hot countries yet!! I was constantly stopping to refill my bottles, get more food, cokes also mandatory ice creams all the time too. Once I filled the water bottles up with new cold water, it would take on average 15-20 minutes for them to be more than warm. I religiously applied factor 50 everyday, but still managed to get decent tan lines everywhere. Approaching Check point 1 this was one of the more serious hills I climbed. The hill went on what it seems was forever, gradual climb with steep bits! I’ve reached Check point 1 in 2 days 11 hours, which was 800 km or 500 miles away from the start line. I still felt good and fresh, no pains or niggles. Once I got my card stamped, as the CP1 was in hotel, I decided to use their bathroom to wash myself and my jersey and I’ve also jumped into my second pair of bibs and I’ve also washed my orange socks! Once that was done, I went outside to dry the jersey which was a bit wet and to leave my bibs to dry out together with my socks! The jersey was dry within 10 minutes and I went off to get some food from the restaurant. As it was still early in the morning, they were serving a buffet and I enjoyed a variety of meat slices, cheeses and breads with orange juice and a coffee! As I faffed around outside, I overheard a conversation nearby and recognized that it is Rimas. A fellow Lithuanian who has done the TCR two times previously, but this time he was around on holiday! as he has done the Alpi 4000 (1200km) event in Italy not too far away and came out to see the riders at the CP 1. We chatted for a bit, I showed him my bike, kit, etc and had to shoot off. He did grab a few pictures of me, which were great! 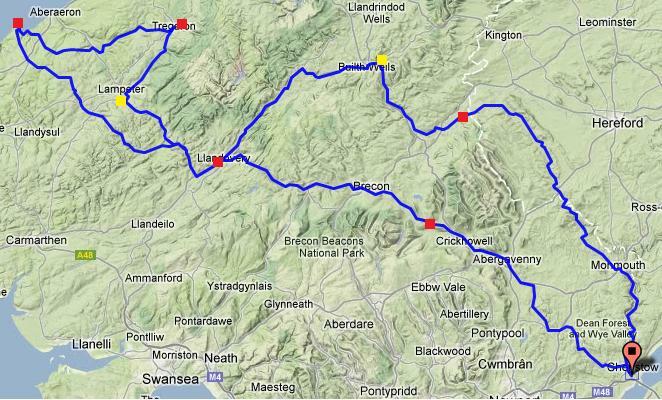 This is my post ride write up for brevet cymru audax and my ride to the start and back! Set off comfortably on Friday at 9 AM towards Chepstown in Wales. After 50k I met up with a colleague of mine, with whom I pre-arranged to meet up for a small ride of the section I was doing, after 18k or so, we departed and I was on my own again for the rest of the day. At around 1PM or so I stopped at pub for a burger and beer! (I was taking it easy as I had plenty of time!) Whilst I waited for the food, I adjusted my tri-bars and I kept doing so through out the day to get the most comfortable position. I will still need to buy bigger risers for the profile design aero bars I am using. Crossed the bridge into Wales at 9-PM, continued on to outskirts of Chepstow, where the ride was starting on Saturday morning. I managed to grab a Dominoes pizza and a bottle of coke and cookies, had a meal and had a browse for parks around on google maps to find a bivvy bag spot. It was my intention to bivvy rather than to book hotel 🙂 Fell asleep shortly after midnight and got up at 4:30AM or so, packed up and headed towards the community hall down the road! At the hall, picked up my brevet card, had cross buns with jam and several coffees, before setting off. I stayed at the front with fast guys and girls for the first 30 km, averaging 30km/h, as this wasn’t really my pace, I dropped bag before another small group caught up with me and I stayed with them for the next 40k where at 70k mark I got a puncture going downhill. Surprisingly, not that many riders passed whilst I got the puncture sorted out, the next control point was only 10k away. I can’t remember where I stopped for food, but I am sure it was a petrol station, usual sandwich/wrap/coke/ice cream combo. 300k – back at west end cafe, where I grabbed beans on toast, stupidly I forgot ask for grated cheese on top! Having eaten that, coffee, can of coke in my jersey pocket, put on my leg warmers, changed my socks and off I went for the last 100k. We were supposed to reach a control point – community hall at 341 – no sign of the hall at all, myself and another guy decided to push on for the last leg, for some we rode together, he was stronger at the climbs, so we departed and then caught up with each other. At about 20k from the finish, the guy had a puncture and I caught up with him, stopped and held my phone as a light for him to fix his puncture, as he didn’t have a head torch (neither did !). Reached the control point at 1:20 AM, a few faces around, most stuffed their cards through the letter box and set off home, as they were locals or had caravans nearby! Myself and another person, sat by the door waited for the organiser to come back and to open the village hall up! Another kind rider came up to check on us and kindly invited us back to his van for warmth! He kindly offered gin and tonic, which we kindly accepted! at about 3AM, organizer arrived back and opened the hall, went in for a kip and got up 6AM. Set off at 6:30 AM for the leg home, cycled on for 20k or maybe more and found a petrol station for food and then carried on repeating the ritual of petrol stations until I reached Hungerford which was roughly 1PM and maybe about 100k in. Had some proper food at a cafe there, I had been there before several times on other Audax rides. Shortly after, I stopped for sleep, around two hours or so and carried on, stopping at a small shop, where I met two other riders, who were amazed where I cycled from! Then another petrol stop station and I was at home roughly at 8PM or so. Not taking the head torch I was given by my cousin for long rides! (I forgot). Not taking gel hand sanitizer which I specifically bought for longer rides. Forgot to buy tri-bar food bags, which would have been handy. Second pair of bib shorts were loose and did not fit well (doh). Nonetheless, good test ride before transcontinental in less than three months now! I will be riding to the start from my home in Surrey. This will be a 220 km ride, a warm up for the audax! I might even ride back, who knows!! Post-ride report will follow up, wish me all the best! Got myself a Bianchi pista – I ride it fixed gear – 48Tx16T at the moment. Might switch to an easier gear, sometime! Perhaps 48×18 would do nicely.